While we advise against using fish-lips as a kissing technique, we couldn’t help but get hooked on them at the resorts on our list of Top 10 Wisconsin Ice Fishing Vacations. Wintertime brings holiday cheer and snuggly nights in front of the fire. However, you can only fight off the hibernating blues and dreams of the big catch for so long. Just because you can’t canoe onto those Wisconsin waters doesn’t mean you should let the fish rest easy. Fine tune that reel, dust off your tackle box and experience the satisfaction of catching the big one. You won’t regret courting Lady Lake Luck at any of these Northwoods angling hot spots. Don’t be fooled by our No. 1 pick’s name. It may highlight its locale next to sand, but we know what really calls to the heart of you avid anglers. Rest assured that in winter, those tan granules give way to white powder and ice. 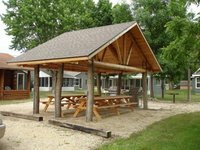 Pitlik’s Sand Beach Resort has 13 cabins conveniently close to the shores of Sand Lake but that’s not the only body of water you can dip your lure into. Pitlik’s is also nine miles southwest of Eagle River. Feel the rush when your tip-up signals the biting of a prize pike or walleye. If you really want to impress your buddies, stay out late and we don’t mean at the local bar. After the sun sinks, so will your jig rod – but not for long! These dark hours are actually the prime time for walleye-seekers. When the other fishermen are getting out of bed, you will have already caught your trophy. Pitlik’s cabins not only showcase the Sugar Camp Chain of Lakes with gorgeous views of Sand Lake, some also speak to modern comfort with an open-view wood burning stove, a fieldstone chimney, screened in porch, patio or spiral staircase. Pitlik’s is ideal for secluded wilderness getaways or wildlife viewing because of the Norway pine, birch, oak and maple that surrounds the resort. 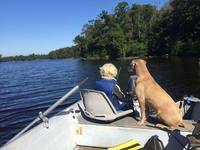 Pitlik’s has been open since 1928 with a mission to deliver Northwoods wilderness relaxation. 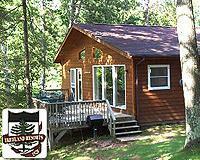 Enjoy the WI outdoors fishing, hiking or sitting by the fire. Located on the shores of High Falls Flowage, one of a series of lakes formed by the Peshtigo River, Popp's Resort presents you with the most incredible setting you could ask for on your fishing vacation. With almost 10,000 acres of wild lands that surrounds the incredible lakes of the High Falls Flowage, this is a destination that is sure to astound you. And at Popp's Resort, you're just steps away from experience all of it, however you want. Fishing enthusiasts are truly in for adventures of an amazing level, as you explore the waters and cast your line for an assortment of species. Teeming with trophy walley, muskie and bass, this is a fishing paradise just waiting for you to discover! If you're here during the wintertime, Popp's Resort has you covered. They offer shanty rentals to make your ice fishing vacation a complete breeze! And Popp's Resort makes it truly easy to do just that. Their Bait & Sport Shop offers you everything you might need for a successful trip. An experienced staff is available to assist in choosing the right bait and products. Let them help direct you to the best spots on the waters to catch just what you're looking for! The resort also offers a variety of fishing boats for rental if you don't have your own. And when it comes to the hours after your fishing journey, Popp's Resort's cozy lakeside cottages are the perfect place to unwind after a long day. Whether you're here with family or on an excursion by yourself, this is a fishing vacation that's sure to hook you! Popp's Resort offers storage units to help make your vacation a little easier. Leave your boat or snowmobiles here and have one less thing to worry about! Popp's Marine offers everything you could need for a fishing vacation. From their Bait & Sport Shop that offers all the essentials to an array of fishing and pontoon boats for rent, you're sure to have access to anything you need for a successful trip! Some resorts and lodges pride themselves on close proximity to a single lake, boasting impressive fishing getaways in the process. At Wild Eagle Lodge, you are conveniently located along the beautiful shores of the Eagle River Chain of 28 Lakes! With so many frozen bodies of water to choose from, you're sure to enjoy a fantastic ice fishing vacation. One-, two-, and three-bedroom lodges feature private patios or balconies, full kitchens, beautiful stone fireplaces, and fantastic views of the Eagle River Chain of Lakes. You'll also have a spacious living/dining area, and enough room for everyone in your group to be comfortable. If you're booking a larger fishing trip, the three-bedroom family deluxe unit is a great option! When it's finally time to get out on the "water", everything you need is waiting for you at Wild Eagle Lodge. Ice houses are available and fishing guides will help you find the perfect spot drop your auger through the ice. An onsite fish cleaning house makes it easy to take care of your catch, and pack it in ice for transportation home. Don't think that winter is the only time to enjoy a fishing trip at Wild Eagle Lodge. Plan your stay during the summer months and you'll have the opportunity to rent out a pontoon or fishing boat for the day. Plus, you'll have access to an outdoor playground, tennis/basketball court, and sand volleyball court right onsite! Chequamegon and Nicolet National Forests sit just a short drive from Wild Eagle Lodge and offer miles of trails that are great for cross-country skiing, dog sledding, and snowmobiling during the winter months! Don't forget to make a reservation at The Blue Heron Restaurant, conveniently located onsite. This is widely considered one of the finest restaurants in the Wisconsin Northwoods. Nestled among the northern pine trees and crystal clear chain of lakes, Nitschke's Northern Resort is ideal for any occasion- especially ice fishing! Nitschke's is the crown jewel resort of the Minocqua area, and it has easy access to Lake Minocqua. In winter time, when you aren't snowshoeing, cross-country skiing, or getting the perfect photo of what appears to be untouched nature after a thick Wisconsin snow, you'll be ice fishing! Depending on the time of year you choose to visit, there are local area events that cater to the fishing crowd, like MuskyFest! Drill a hole, wear some long underwear, and have the time of your life! The resort neighbors Hiawatha Trail and Bearskin State Park Trail, and is three miles from the center of town. How do you say it? ZeBay? DeBay? Nope, it’s DuBay! Though Lake DuBay may sound like “the bay” with a slight cold, this 7,000-acre flowage is healthy and teeming with the objects of your dreams. That is, mainly musky, large and smallmouth bass, bluegill, crappie, walleye and more. 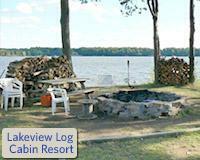 Lakeview Log Cabin Resort, our No. 6 pick, has a fairly self-explanatory name, but there’s more behind the name that we feel compelled to introduce you to. The five modern cabin homes have various options for housing your party, large or small, and the resort offers all the fisherman’s necessities: a fish cleaning house, freezer storage, a bait shop and license sales. Not only is Lakeview’s attentive staff on hand to make your stay at Lake DuBay as relaxing and convenient as possible, but local fishing guides from Hooksetters are also nearby to make this WI fishing vacation a success! Don’t forget to explore dry land, as well. Check out the Stevens Point Brewery or casinos in the Wausau area. Bed linens, high-speed Internet, garbage bags, dish soap, dishes, air conditioning/heat and more. When we embarked on our mission to complete our list of Top 10 Wisconsin Ice Fishing Vacations, one absolute requirement came to mind. We wanted a warm place to rest after the day of ice and cold. Fortunately for us – and for you – our No. 7 pick has this and much more! Not only does Ward’s Riverside Cabins have cabins with four walls and a roof to block out the cold, they also have warm bed linens, an outdoor firepit and a coffee pot to keep you warm outdoors in those early morning hours. But we know you anglers are itching to move from dry land to water – frozen water that is. The shallow backwaters of the Mississippi are your ice mine – errr, gold mine for panfish and maybe even that 40-in.-plus pike. When you’re not playing on the ice, play in the snow. No, we aren’t referring to making snow angels – although that is a perfectly acceptable past time. We’re referring to the snowmobile trails close to Ward’s Riverside! The owners of Ward’s Riverside also make log furniture, such as beds, dressers, tables and more. Ward’s Riverside supplies wood for the firepit and an onsite cleaning house for fish or game that you hunted during your stay. What could top staying at a resort with a history of hospitality reaching back to 1928 that is also by the Chippewa Flowage? Well, our No. 8 spot not only lays claim to one of these resorts – its grand total comes to four! Treeland Resort not only boasts lodging with leather furniture and gas-log fireplaces, it also provides fish cleaning stations and a main lodge with a game room, restaurant and bar. Treeland is also mere steps from the Chippewa Flowage, Wisconsin’s third largest lake. Plumb the dark depths with the help of fishing guides, or go solo to win the Treelands Walleye Challenge or Lake Chippewa Flowage Musky Hunt contest. The family can sprawl out in spacious five-bedroom cabins, or you can cozy up to your sweetie in front of a fieldstone fireplace in a one-bedroom cabin overlooking Musky Bay. Each resort in the Treelands Resorts group has its own outdoor heated swimming pool. As promised, our No. 9 spot is a sister property in the Treelands Resorts group. Can you really blame us for highlighting another when it plays such a significant role in the legacy of WI angling? We thought not. And that’s why we’ve chosen Pat’s Landing to round out our list. Sunsets over the Chippewa Flowage are widely acclaimed, but Pat’s Landing may have stumbled upon something when they built their newest condos to face the sunrise. Though we realize any self-respecting ice angler would already be on the lake, we couldn’t help but test the view once from the inside. Another inside amenity that we feel is beneficial for ridding your bones of every last chill is Pat’s Landing’s bar. Swap stories about your big day and the best hot spots with other anglers over a pint or a plate of delicious comfort food. If your little one is nagging you for a change of scenery, take them cross country skiing on the kilometers of groomed Wisconsin trails. Or, show them a different thrill – the thrill of the hunt! 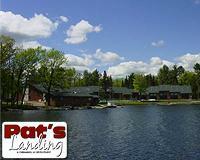 Pat’s Landing is also an ideal resort for your summer Wisconsin family vacation. The kids will be endlessly entertained with hiking trails, an outdoor playground and heated swimming pool, the sand beach, putting green and more. Internet, TVs in bedrooms, TV/VCR/DVD and fireplace in the great room, washer/dryer unit, a bar and grill restaurant overlooking Chief Lake and more. Being confined by four wooden walls may make your ice fishing expedition warmer, but we found that we missed the connection with our surroundings while waiting for the fish to bite. This is why we searched – and found – a unique ice fishing ground, our No. 3 spot. 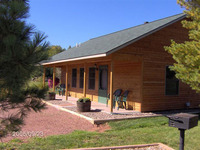 Woodside Cottages of Bayfield has chosen to set up camp in the form of 13 pristine cottages next to Lake Superior. The quaint Wisconsin town of Bayfield is known as the gateway to the Apostle Islands. No, it’s not the pearly gates, but it’s the closest thing to angling heaven on earth! There are not three, not 11, but 21 islands in the Apostle chain, plus 12 miles of mainland. When those first cold gales of wind pick up, ice anglers wait in anticipation of the Superior ice caves on the Bayfield Peninsula and shores of Apostle Islands. A gleaming glass floor of ice in the caves paves the way for serene ice fishing in an exotic surrounding. And when you’ve strung a satisfying line of lake trout, you can return to your Woodside cottage to rest in front of the fire or thaw out in the Jacuzzi. Take a short 1.5-mile ride into the town of Bayfield on your snowmobile or hit the hundreds of state and forest snowmobile tracks in the area. From Ashland, WI, take U.S. Hwy. 2 W to Hwy. 13 N. Hwy. 13 N will bring you into Bayfield. Approximately a half of a mile south of Bayfield, turn right at the intersection of Hwy. 13 N and County Road J. Woodside Cottages are adjacent to the Fore ‘n Aft Restaurant. Each cottage comes equipped with conveniences like high-speed wireless Internet, a gas fireplace, coffee maker, dishwasher, pine vaulted ceilings and more.